There is so much attention paid to summer vacation and where you should enjoy the sunniest days of the year, but what about the colder months? With the excitement of Christmas and New Years, we tend to forget that a winter getaway is one of the most charming and fun experiences you can treat yourself to. Is there anything more magical than a charming New England town covered in snow? We don’t think so. Plan a trip for yourself and discover why you should take the perfect winter getaway to Mystic, CT! to discover three of our favorite activities during this season and start planning your visit today. Make sure you don’t miss out on all the wonderful events and experiences our area has to offer when you download our free Vacation Guide! Once you read up on all the top restaurants, events, museums, shops, and outdoor adventures mentioned inside, you’ll be a local expert in no time! There’s a wide range of things to do in Mystic in the winter, but one activity we particularly love is a visit to the Mystic Seaport! It’s one of the largest New England museums and offers an incredible experience to each visitor. Travel back in time through the 19th-century inspired village that surrounds the museum and discover the fascinating maritime past of our country. Board the Charles W. Morgan vessel, take a stroll through the merchant’s shops, and listen to the tales told by the storytellers and musicians around the village! If you happen to be in Mystic in November or December, make sure you book tickets for the lantern light tours! This activity is a fun way to explore the museum with your loved ones. A costumed guide will take you through a real-life Christmas Carol adventure, which includes a horse-drawn carriage ride, lively tunes, and dozens of lanterns scattered all across the village. A winter getaway in Mystic wouldn’t be complete with some real winter activities. How about trying out cross-country skiing this year? Connecticut has a variety of scenic trails you can explore, all boasting stunning landscapes! The James L. Goodwin State Forest is one of the best locations to enjoy this great Northern pastime. The frozen lake there is guaranteed to take your breath away, so remember to bring your camera! Wadsworth Falls State Park is another good spot, which offers an easy trail ideal for beginners! If you’re visiting around the Christmas season, there’s an event you don’t want to miss. Drive a little over an hour to neighboring state Rhode Island and enjoy the luxurious spectacle of the Breakers Mansions in Newport! If Downton Abbey is your favorite TV show, and you want to experience the magnificence of these luxurious houses, then Christmas at the Newport Mansions is a must-see spectacle! Take a guided tour during the day, or even better, book tickets for one of the Christmas nights. You can enjoy a free visit to the mansions as well as complimentary beverages such as cider while swinging to the sound of the Christmas orchestra. There’s nothing like a New England getaway to brighten up the gray winter days! 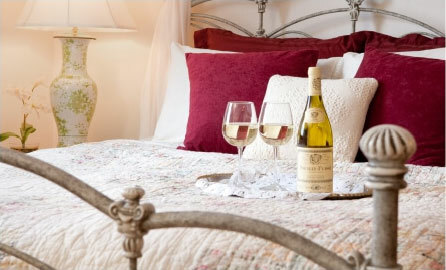 Take your significant other on a magical winter getaway to Mystic and stay at Stonecroft Country Inn, a cozy bed and breakfast that offers beautiful accommodations. You can explore the attractions in our surrounding area, or simply unwind on our peaceful property. Do you want to turn your winter visit into a romantic getaway? Our Stonecroft Room is perfect for you. This second-floor suite offers all the charm and privacy you need. 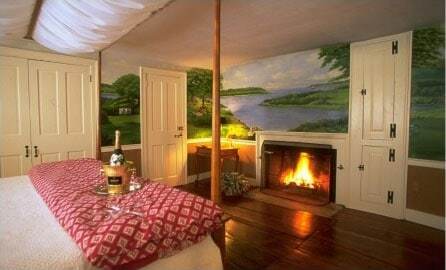 Light up the fireplace, pour yourselves a glass of wine and get a good night’s sleep in the luxurious king-size bed. When you open your eyes the next morning, follow the smell of freshly brewed coffee downstairs, and you will find a delicious homemade breakfast waiting for you! 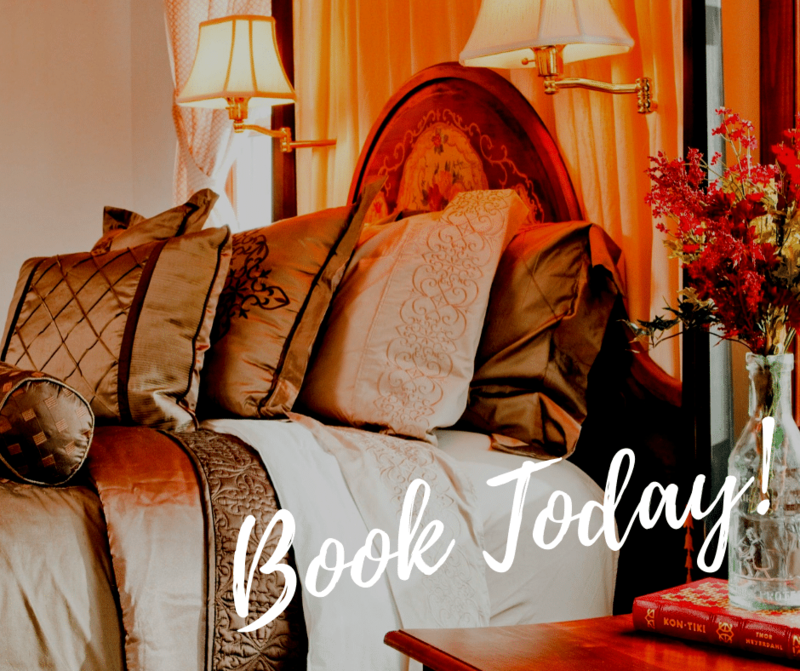 Book Your Winter Stay Today!